Chang'e 4 ( /tʃɑːŋˈə/ ; Chinese :嫦娥四号; pinyin :Cháng'é Sìhào; literally: ' Chang'e No. 4') is a Chinese lunar exploration mission that achieved the first soft landing on the far side of the Moon, on 3 January 2019. A communication relay satellite, Queqiao, was first launched to a halo orbit near the Earth-Moon L2 point in May 2018. The robotic lander and Yutu 2 (Chinese: 玉兔二号; literally :"Jade Rabbit No. 2") rover  were launched on 7 December 2018 and entered orbit around the Moon on 12 December 2018. Chang'e or Chang-o, originally known as Heng'e, is the Chinese goddess of the Moon. She is the subject of several legends in Chinese mythology, most of which incorporate several of the following elements: Houyi the archer, a benevolent or malevolent emperor, an elixir of life, and the Moon. She is married to the archer Houyi. In modern times, Chang'e has been the namesake of the Chinese Lunar Exploration Program. The mission is the follow-up to Chang'e 3, the first Chinese landing on the Moon. The spacecraft was originally built as a backup for Chang'e 3 and became available after Chang'e 3 landed successfully in 2013. The configuration of Chang'e 4 was adjusted to meet new scientific objectives. Like its predecessors, the mission is named after Chang'e, the Chinese Moon goddess. Chang'e 3 is an unmanned lunar exploration mission operated by the China National Space Administration (CNSA), incorporating a robotic lander and China's first lunar rover. It was launched in December 2013 as part of the second phase of the Chinese Lunar Exploration Program. The mission's chief commander was Ma Xingrui. The Chinese Lunar Exploration Program, also known as the Chang'e Project after the Chinese moon goddess Chang'e, is an ongoing series of robotic Moon missions by the China National Space Administration (CNSA). The program incorporates lunar orbiters, landers, rovers and sample return spacecraft, launched using Long March rockets. Launches and flights are monitored by a Telemetry, Tracking, and Command (TT&C) system, which uses 50-metre (160-foot) radio antennas in Beijing and 40-metre (130-foot) antennas in Kunming, Shanghai, and Ürümqi to form a 3,000-kilometre (1,900-mile) VLBI antenna. A proprietary ground application system is responsible for downlink data reception. 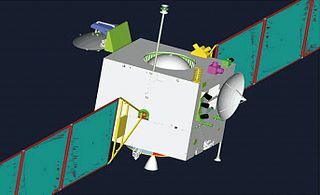 Chang'e 1 was an unmanned Chinese lunar-orbiting spacecraft, part of the first phase of the Chinese Lunar Exploration Program. The spacecraft was named after the Chinese Moon goddess, Chang'e. Chang'e 2 is a Chinese unmanned lunar probe that was launched on 1 October 2010. It was a follow-up to the Chang'e 1 lunar probe, which was launched in 2007. Chang'e 2 was part of the first phase of the Chinese Lunar Exploration Program, and conducted research from a 100-km-high lunar orbit in preparation for the December 2013 soft landing by the Chang'e 3 lander and rover. Chang'e 2 was similar in design to Chang'e 1, although it featured some technical improvements, including a more advanced onboard camera. Like its predecessor, the probe was named after Chang'e, an ancient Chinese moon goddess. Von Kármán is a large lunar impact crater that is located in the southern hemisphere on the far side of the Moon. 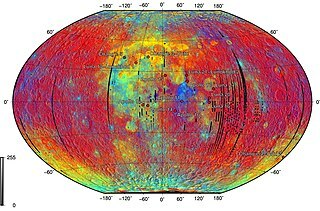 The crater is about 180 km in diameter and it is located within an even larger impact crater known as the South Pole–Aitken basin of roughly 2,500 km (1,600 mi) in diameter and 13 km (8.1 mi) deep. Von Kármán is the site of the first soft-landing on the lunar far side by the Chinese Chang'e 4 spacecraft on 3 January 2019. Measure lunar surface temperature over the duration of the mission. Observe the solar corona, investigate its radiation characteristics and mechanism, and to explore the evolution and transport of coronal mass ejections (CME) between the Sun and Earth. Chang'e 4 – Lander (left arrow) and Rover (right arrow) on the Moon surface (8 February 2019). 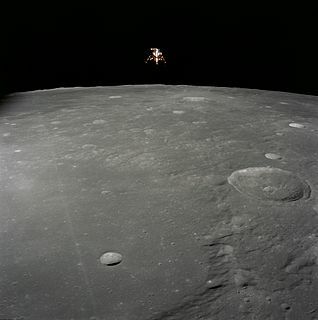 Landing Camera (LCAM), mounted on the bottom of the spacecraft, the camera began to produce a video stream at the height of 12 km (7.5 mi) above the lunar surface. Terrain Camera (TCAM), mounted on top of the lander and able to rotate 360°, is being used to image the lunar surface and the rover in high definition. Low Frequency Spectrometer (LFS)  to research solar radio bursts at frequencies between 0.1–40 MHz and to study the lunar ionosphere. Visible and Near-Infrared Imaging Spectrometer (VNIS), for imaging spectroscopy that can then be used for identification of surface materials and atmospheric trace gases. The spectral range covers visible to near-infrared wavelengths (450 nm - 950 nm). The physical exploration of the Moon began when Luna 2, a space probe launched by the Soviet Union, made an impact on the surface of the Moon on September 14, 1959. Prior to that the only available means of exploration had been observation from Earth. The invention of the optical telescope brought about the first leap in the quality of lunar observations. Galileo Galilei is generally credited as the first person to use a telescope for astronomical purposes; having made his own telescope in 1609, the mountains and craters on the lunar surface were among his first observations using it. In orbital mechanics, a Lissajous orbit, named after Jules Antoine Lissajous, is a quasi-periodic orbital trajectory that an object can follow around a Lagrangian point of a three-body system without requiring any propulsion. Lyapunov orbits around a Lagrangian point are curved paths that lie entirely in the plane of the two primary bodies. In contrast, Lissajous orbits include components in this plane and perpendicular to it, and follow a Lissajous curve. Halo orbits also include components perpendicular to the plane, but they are periodic, while Lissajous orbits are not. A rover is a space exploration vehicle designed to move across the surface of a planet or other celestial body. Some rovers have been designed to transport members of a human spaceflight crew; others have been partially or fully autonomous robots. Rovers usually arrive at the planetary surface on a lander-style spacecraft. Rovers are created to land on another planet, besides Earth, to find out information and to take samples. They can collect dust, rocks, and even take pictures. They are very useful for exploring the universe. A halo orbit is a periodic, three-dimensional orbit near the L1, L2 or L3 Lagrange point in the three-body problem of orbital mechanics. 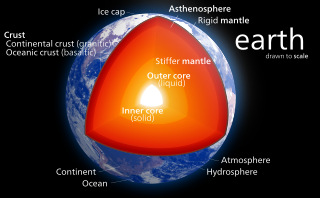 Although the Lagrange point is just a point in empty space, its peculiar characteristic is that it can be orbited. 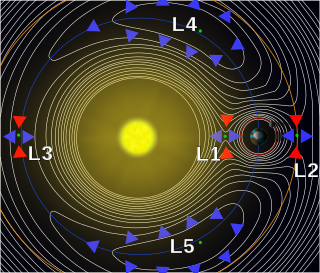 Halo orbits can be thought of as resulting from an interaction between the gravitational pull of the two planetary bodies and the Coriolis and centrifugal accelerations on a spacecraft. Halo orbits exist in any three-body system, e.g. the Sun–Earth–Orbiting Satellite system and the Earth–Moon–Orbiting Satellite system. Continuous "families" of both Northern and Southern halo orbits exist at each Lagrange point. Because halo orbits tend to be unstable, stationkeeping is required to keep a satellite on the orbit. SELENE-2, or the Selenological and Engineering Explorer 2, is a cancelled Japanese robotic mission to the Moon that would have included an orbiter, a lander and a rover. It was intended as a successor to the 2007 SELENE (Kaguya) lunar orbiter. 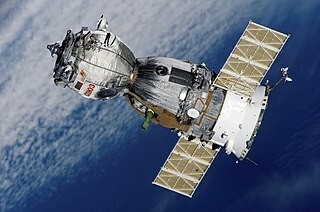 Several Asian countries have space programs and are actively competing to achieve scientific and technological advancements in space, a situation sometimes referred to as the Asian space race in the popular media as a reference to the earlier Space Race between the United States and the Soviet Union. Like the previous space race, issues involved in the current push to space include national security, which has spurred many countries to send artificial satellites as well as humans into Earth orbit and beyond. A number of Asian countries are seen as contenders in the ongoing race to be the pre-eminent power in space. Chandrayaan-2 is India's second lunar exploration mission after Chandrayaan-1. Developed by the Indian Space Research Organisation (ISRO), the mission is planned to be launched to the Moon by a Geosynchronous Satellite Launch Vehicle Mark III. It includes a lunar orbiter, lander and rover, all developed by India. A lunar rover or Moon rover is a space exploration vehicle (rover) designed to move across the surface of the Moon. The Lunar Roving Vehicle was designed to be driven by members of human spaceflight crews from the U.S. Apollo program. Other rovers have been partially or fully autonomous robots, such as Soviet Lunokhods and the Chinese Yutus. Three countries have had rovers on the Moon: the Soviet Union, the United States and China. Japan and India currently have planned missions. This article lists achieved spaceflight events in 2018. For the first time since 1990, more than 100 orbital launches were performed globally. Chang'e 5 is a robotic Chinese lunar exploration mission consisting of a lander and a sample-return vehicle. It is currently under development and it is scheduled for a launch in December 2019, after being postponed due to the failure of the Long March 5 launch vehicle in 2017. Chang'e 5 will be China's first sample return mission, aiming to return at least 2 kilograms of lunar soil and rock samples back to the Earth. Like its predecessors, the spacecraft is named after the Chinese moon goddess, Chang'e. This will be the first lunar sample-return mission since Luna 24 in 1976. 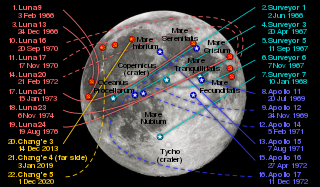 The (Japanese) Lunar Exploration Program (月探査計画), is a program of robotic and human missions to the Moon undertaken by the Japanese Aerospace Exploration Agency (JAXA), and its division, the Institute of Space and Astronautical Science (ISAS). It is also one of the three major enterprises of the JAXA Space Exploration Center (JSPEC). The main goal of the program is "to elucidate the origin and evolution of the Moon and utilize the Moon in the future". Yutu was a robotic lunar rover that formed part of the Chinese Chang'e 3 mission to the Moon. It was launched at 17:30 UTC on 1 December 2013, and reached the Moon's surface on 14 December 2013. 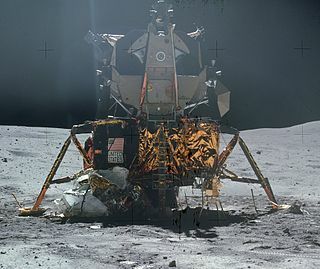 The mission marks the first soft landing on the Moon since 1976 and the first rover to operate there since the Soviet Lunokhod 2 ceased operations on 11 May 1973. Chang'e 6 is a planned robotic Chinese lunar exploration mission expected to be launched in 2023 or 2024 and perform China's second sample return mission. Like its predecessors, the spacecraft is named after the Chinese moon goddess Chang'e. 1 2 3 China says it will launch 2 robots to the far side of the moon in December on an unprecedented lunar exploration mission Archived 9 December 2018 at the Wayback Machine . Dave Mosher, Business Insider. 16 August 2018. 1 2 3 4 Chang'e 3, 4 (CE 3, 4) Archived 20 March 2018 at the Wayback Machine . Gunter Dirk Krebs, Gunter's Space Page. 1 2 This is the rover China will send to the 'dark side' of the Moon Archived 31 August 2018 at the Wayback Machine . Steven Jiang, CNN News. 16 August 2018. 1 2 3 "探月工程嫦娥四号探测器成功发射 开启人类首次月球背面软着陆探测之旅". China National Space Administration (in Chinese). Archived from the original on 10 December 2018. Retrieved 8 December 2018. ↑ Chang'e-4: Far side of the Moon lander and rover mission to launch in December Archived 13 July 2018 at the Wayback Machine . Global Times, 18 June 2018. ↑ Launch Schedule 2018 Archived 16 August 2018 at the Wayback Machine . SpaceflightNow, 18 September 2018. ↑ Barbosa, Rui (3 January 2019). "China lands Chang'e-4 mission on the far side of the Moon". Nasaspacefight. Archived from the original on 3 January 2019. Retrieved 3 January 2019. 1 2 3 4 China's Journey to the Lunar Far Side: A Missed Opportunity? Paul D. Spudis, Air & Space Smithsonian. 14 June 2017. 1 2 Ye, Peijian; Sun, Zezhou; Zhang, He; Li, Fei (2017). "An overview of the mission and technical characteristics of Change'4 Lunar Probe". Science China Technological Sciences. 60 (5): 658. doi:10.1007/s11431-016-9034-6. ↑ Lyons, Kate. "Chang'e 4 landing: China probe makes historic touchdown on far side of the moon". The Guardian. Archived from the original on 3 January 2019. Retrieved 3 January 2019. 1 2 "China successfully lands Chang'e-4 on far side of Moon". Archived from the original on 3 January 2019. Retrieved 3 January 2019. ↑ This map shows exactly where China landed its Chang'e-4 spacecraft on the far side of the moon Archived 4 January 2019 at the Wayback Machine . Dave Mosherand and Shayanne Gal, Business Insider. 3 January 2019. 1 2 3 4 5 China Prepares for Breakthrough Chang'e 4 Moon Landing in 2018 Archived 11 January 2018 at the Wayback Machine . Sputnik News, 31 December 2017. ↑ China lays out its ambitions to colonize the moon and build a "lunar palace" Archived 29 November 2018 at the Wayback Machine . Echo Huang, Quartz. 26 April 2018. ↑ China's moon mission to boldly go a step further Archived 31 December 2017 at the Wayback Machine . Stuart Clark, The Guardian 31 December 2017. ↑ "China Outlines New Rockets, Space Station and Moon Plans". Space. 17 March 2015. Archived from the original on 1 July 2016. Retrieved 27 March 2015. ↑ "Ouyang Ziyuan portrayed Chang E project follow-up blueprint". Science Times. 9 December 2011. Archived from the original on 3 February 2012. Retrieved 25 June 2012. ↑ Witze, Alexandra (19 March 2013). "China's Moon rover awake but immobile". Nature. doi:10.1038/nature.2014.14906. Archived from the original on 23 March 2014. Retrieved 25 March 2014. ↑ China launches historic mission to land on far side of the moon Archived 7 December 2018 at the Wayback Machine Stephen Clark, Spaceflight Now. 7 December 2018. ↑ "China's Chang'e-4 probe decelerates near moon". Xinhua. 12 December 2018. Archived from the original on 12 December 2018. Retrieved 12 December 2018. ↑ "China's Chang'e-4 probe changes orbit to prepare for moon-landing". XinhuaNet. 30 December 2018. Archived from the original on 1 January 2019. Retrieved 31 December 2018. ↑ Jones, Andrew (31 December 2018). "How the Chang'e-4 spacecraft will land on the far side of the Moon". GBTIMES. Archived from the original on 2 January 2019. Retrieved 3 January 2019. 1 2 China's Moon Missions Are Anything But Pointless. Paul D. Spudis, Air & Space Smithsonian. 3 January 2017. ↑ To the Far Side of the Moon: China's Lunar Science Goals Archived 10 March 2018 at the Wayback Machine . Leonard David, Space. 9 June 2016. 1 2 Wall, Mike (18 May 2018). "China Launching Relay Satellite Toward Moon's Far Side Sunday". Space.com. Archived from the original on 18 May 2018. ↑ Emily Lakdawalla (14 January 2016). "Updates on China's lunar missions". The Planetary Society. Archived from the original on 17 April 2016. Retrieved 24 April 2016. 1 2 3 Jones, Andrew (24 April 2018). "Chang'e-4 lunar far side satellite named 'magpie bridge' from folklore tale of lovers crossing the Milky Way". GBTimes. Archived from the original on 29 April 2018. Retrieved 28 April 2018. ↑ Future Chinese Lunar Missions: Chang'e 4 - Farside Lander and Rover. David R. Williams, NASA Goddard Space Flight Center. 7 December 2018. 1 2 3 4 Xu, Luyuan (15 June 2018). "How China's lunar relay satellite arrived in its final orbit". The Planetary Society. Archived from the original on 17 October 2018. ↑ Radio Experiment Launches With China's Moon Orbiter. David Dickinson, Sky & Telescope. 21 May 2018. ↑ China Moon Mission: Lunar Microsatellite Problem?. Leonard David, Inside Outer Space. 27 May 2018. 1 2 Chang'e-4 lunar far side mission to carry microsatellites for pioneering astronomy Archived 9 March 2018 at the Wayback Machine . Andrew Jones, GB Times. March 2018. 1 2 This weekend, China embarks on a historic mission to land on the far side of the Moon Archived 7 December 2018 at the Wayback Machine . Loren Grush, The Verge. 6 December 2018. ↑ Pioneering Chang’e-4 lunar far side landing mission to launch in December. Andrew Jones, Space News. 15 August 2018. 1 2 China Shoots for the Moon's Far Side. (PDF) IEEE.org. 2018. ↑ China's Chang'e 4 spacecraft to try historic landing on far side of Moon 'between January 1 and 3' Archived 2 January 2019 at the Wayback Machine . South China Morning Post. 31 December 2018. ↑ Chang’e-4 powers down for second lunar night. Andrew Jones, SpaceNews. 11 February 2019. ↑ Chang’e-4 powers down for second lunar night. Vadim Ioan Caraiman, Great Lakes Ledger. 11 February 2019. ↑ Robinson, Mark (6 February 2019). "First Look: Chang'e 4". Arizona State University. Retrieved 8 February 2019. 1 2 Chang'e 4 Relay Archived 1 January 2018 at the Wayback Machine . Gunter Dirk Krebs, Gunter's Space Page. 1 2 Plans for China's farside Chang'e 4 lander science mission taking shape Archived 23 June 2016 at the Wayback Machine . Emily Lakdawalla, The Planetary Society, 22 June 2016. ↑ Andrew Jones (11 January 2018). "Testing on China's Chang'e-4 lunar far side lander and rover steps up in preparation for launch". GBTimes. Archived from the original on 12 January 2018. Retrieved 12 January 2018. 1 2 David, Leonard. "Comsat Launch Bolsters China's Dreams for Landing on the Moon's Far Side". Scientific American. Archived from the original on 29 November 2018. ↑ "Netherlands-China Low-Frequency Explorer (NCLE)". ASTRON. Archived from the original on 10 April 2018. Retrieved 10 April 2018. ↑ NASA (8 February 2019). "Chang'e 4 Rover comes into view". EurekAlert! . Retrieved 9 February 2019. 1 2 Andrew Jones (16 May 2016). "Sweden joins China's historic mission to land on the far side of the Moon in 2018". GBTimes. Archived from the original on 12 January 2018. Retrieved 12 January 2018. ↑ The Lunar Lander Neutron & Dosimetry (LND) Experiment on Chang'E4 Archived 3 January 2019 at the Wayback Machine . (PDF) Robert F. Wimmer-Schweingruber, S. Zhang, C. E. Hellweg, Jia Yu, etal. Institut für Experimentelle und Angewandte Physik. Germany. ↑ Geological Characteristics of Chang'e-4 Landing Site Archived 31 May 2018 at the Wayback Machine . (PDF) Jun Huang, Zhiyong Xiao, Jessica Flahaut, Mélissa Martinot, Xiao Xiao. 49th Lunar and Planetary Science Conference 2018 (LPI Contrib. No. 2083). 1 2 3 Zheng, William (15 January 2019). "Chinese lunar lander's cotton seeds spring to life on far side of the moon". South China Morning Post. Retrieved 15 January 2019. ↑ Moon sees first cotton-seed sprout. Xinhua News. 15 January 2019. ↑ China Is About to Land Living Eggs on the Far Side of the Moon Archived 2 January 2019 at the Wayback Machine . Yasmin Tayag, Inverse. 2 January 2019. ↑ Rincon, Paul (2 January 2019). "Chang'e-4: China mission primed for landing on Moon's far side". BBC News. Archived from the original on 3 January 2019. Retrieved 3 January 2019. ↑ Space 2018: China mission will create miniature ecosystem on Moon Archived 4 April 2018 at the Wayback Machine . Karen Graham, Digital Journal. 6 January 2018. ↑ Forget the stratospheric chicken sandwich, China is sending potato seeds and silkworms to the Moon Archived 11 January 2018 at the Wayback Machine . Andrew Jones, GB Times. 14 June 2017. ↑ China Focus: Flowers on the Moon? China's Chang'e-4 to launch lunar spring Archived 27 December 2018 at the Wayback Machine . Xinhua (in English). 4 April 2018. 1 2 Lunar nighttime brings end to Chang'e-4 biosphere experiment and cotton sprouts. Andrew Jones, GB Times. 16 January 2019. ↑ China's first plant to grow on the moon is already dead. Yong Xiong and Ben Westcott, CNN News. 17 January 2019. ↑ "China Plans First Ever Landing on the Lunar Far Side". Space Daily. 22 May 2015. Archived from the original on 26 May 2015. Retrieved 26 May 2015. ↑ "Hsue-Shen Tsien". Mathematics Genealogy Project. Archived from the original on 9 December 2018. Retrieved 7 December 2018. ↑ "Chang'e 4: China probe lands on far side of the moon". The Guardian . 3 January 2019. Archived from the original on 3 January 2019. Retrieved 3 January 2019. ↑ Chang'e-4: Chinese rover now exploring Moon Archived 4 January 2019 at the Wayback Machine . Paul Rincon, BBC News. 4 January 2019. ↑ "Chang'e-4 spacecraft enter lunar nighttime, China planning future missions, cooperation". 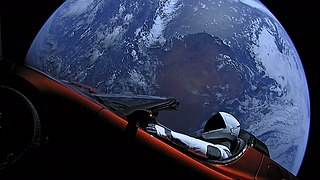 Space News. 15 January 2019. Retrieved 14 February 2019. ↑ "Farside Politics: The West Eyes Moon Cooperation with China". Scientific American. 7 February 2019. Retrieved 14 February 2019. ↑ "Space a new realm for Sino-US cooperation". China Daily. 13 February 2019. Retrieved 14 February 2019. ↑ Needham, Kirsty (19 January 2019). "Red moon rising: China's mission to the far side". The Sydney Morning Herald. Wikimedia Commons has media related to Chang'e 4 .